Block 19 of the Block a Week CAL (hosted by Kimberly Slifer) is Donna Mason-Svara’s pretty Lemony Lime Citrus Square. My square does not look very Lemony Lime Citrus, I’ll be the first to admit. 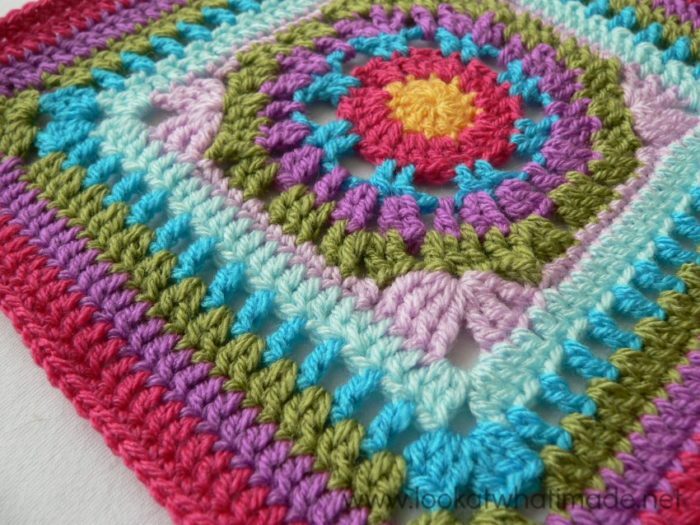 The original was done with Hobby Lobby “I Love This Yarn” in Buttercup, Pistache, and White. And it does look quite citrusy. My version is more like an exotic fruit salad. 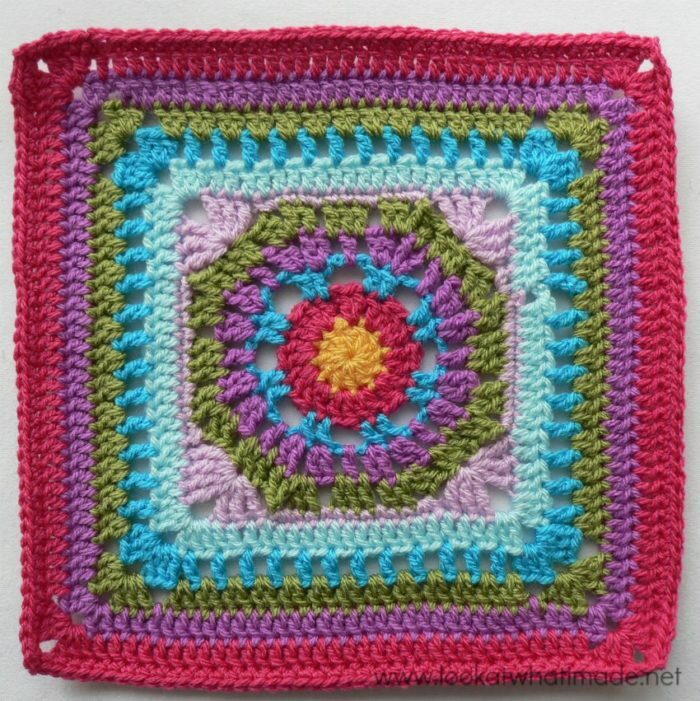 If you are unfamiliar with Donna’s designs, do yourself a MASSIVE favour and have a look at either her Ravelry Store or her blog, SmoothFox Crochet. She has some amazing blankets and squares! The initial ch st’s in each round are counted as a stitch, except for the initial ch st in Round 6, which doesn’t count as a stitch. Thank you very much to Donna Mason-Svara for giving us permission to do this photo-tutorial for her Lemony Lime Citrus Square. And a special thank you to Kimberly Slifer for letting me do these tutorials and for obtaining the necessary permission. Into a magic ring: ch 3 (this counts as your first dc). Dc x 11 into the ring and pull the ring tight. Join to the top of the initial ch-3 with a sl st. If you are not familiar with working into a magic ring, this video tutorial from The Crochet Crowd is very good. Please remember, when working into a magic ring you HAVE to work away your initial tail very well. If you just cut it, your whole square might unravel! Round 2 is an easy one: 2 dc’s in each stitch around. Remember that the initial ch-3 counts as a dc. You can start with a ch-3 for your first dc (as in the pattern), or you can start with a standing double crochet (as I have done). Either way, when you have made that first st/ch-3, dc in the next st and ch 3 (Photo 1). *Skip the next st, dc in the next 2 st’s and ch 3 (Photo 2). * Repeat around and join as instructed in the pattern. 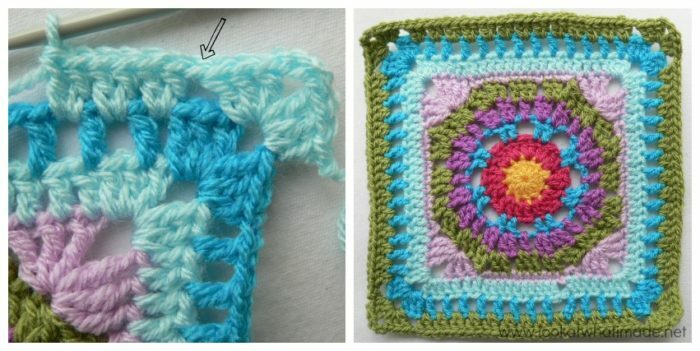 Don’t forget that skipped stitch (indicated with an arrow in Photo 2). At the end of this round your work will pull up slightly (Photo 4). This will be corrected in the next round. Ch 3 (counts as your first dc) and dc in the same stitch. 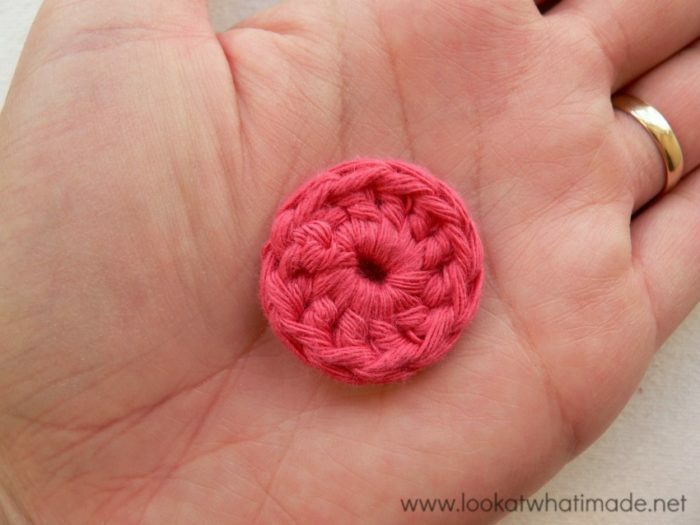 (Remember you can start with a standing double crochet instead.) The pattern tells you to mark this second dc. Feel free to do so, but it isn’t necessary if you are following this tutorial. Ch 2 (Photo 1) and make 2 dc’s in the next stitch (Photo 2). Ch 1 (Photo 3), dc in the ch-3 space, and ch 1 again (Photo 4). *Make 2 dc’s in the next st, ch 2, and make 2 dc’s in the next st (Photo 5). Ch 1, dc in the ch-3 space, ch 1. 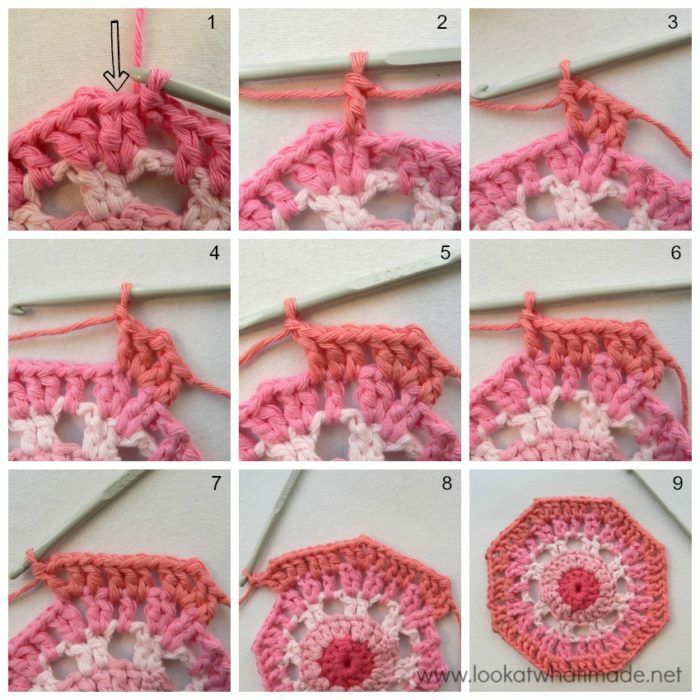 * Repeat around as instructed in the pattern and join to the top of the beginning ch-3 (or standing double crochet) with a sl st. Round 4 of the Lemony Lime Citrus Square in all it’s Stylecrafty Glory! If you are going to keep using the same colour, sl st into the next st (indicated with an arrow in Photo 1). 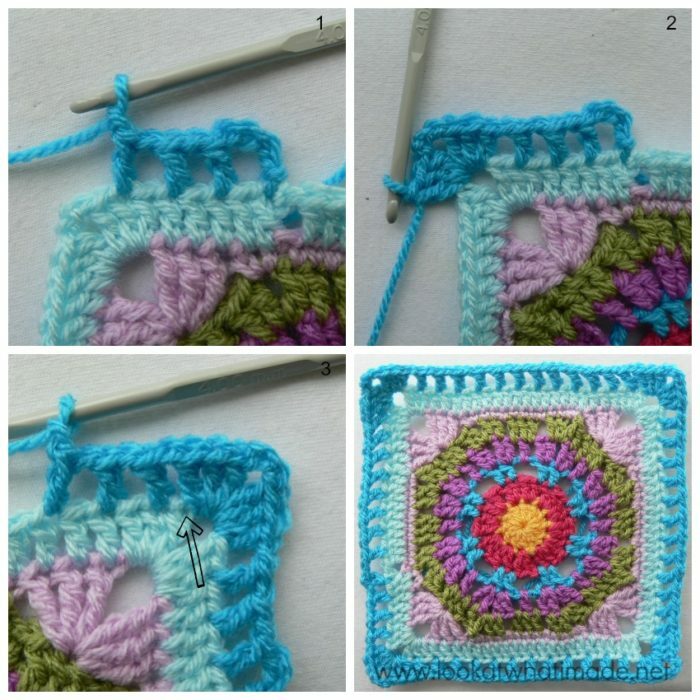 If you are going to use a different colour for this round, join your yarn by making a sl st in the st after the sl st join (indicated with an arrow in Photo 1). You want to start this round in the dc right before the ch-2 corner space in the previous round. Ch 3 (this counts as your first dc). See Photo 2. (Dc, ch 2, dc) into the ch-2 corner space (Photo 3). Dc in the next st (Photo 4). 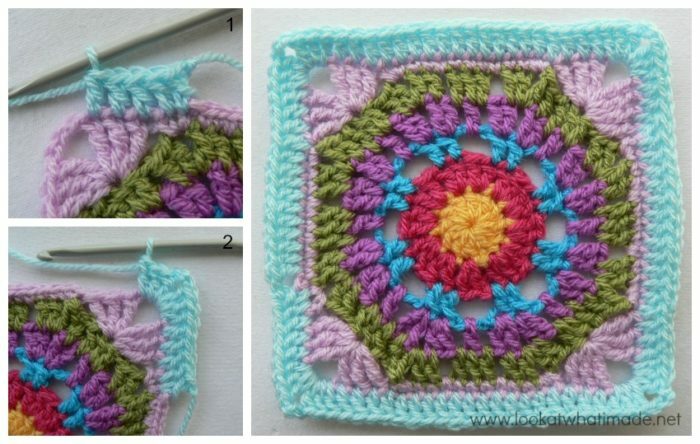 If you need help identifying which loops belong to which stitch, see this tutorial. Ch 1 and skip the next st. Dc into the ch-1 space. Dc into the next dc. Dc into the ch-1 space. Ch 1 (Photo 5) and skip the next stitch. You want to end up with 3 dc’s (this will form your side), separated from the corners by a ch st on either side. *Dc in the next st (Photo 6). Note that this dc should fall in the dc before the corner ch-2 space. (dc, ch 2, dc) into the corner ch-2 space (Photo 7). Dc in the next st. Ch 1 and skip the next st. Dc in the ch-1 space. Dc in the next dc. Dc in the next ch-1 space. 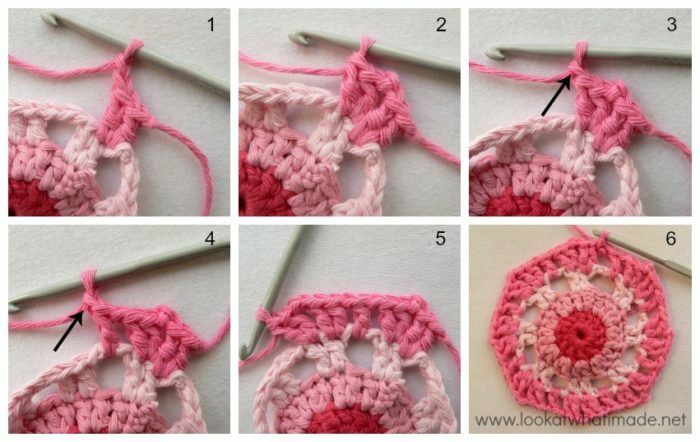 Ch 1 and skip the next st.* Repeat around and join as instructed in the pattern. In Photos 7 and 8 you can see the 3 central dc’s and the ch st’s on either end. This is Round 5 having a little nap on the Pansy Pizza. I told him he wasn’t allowed to, but since last week’s square got to have a nap on it, it caused a terrible tantrum, so I gave in. 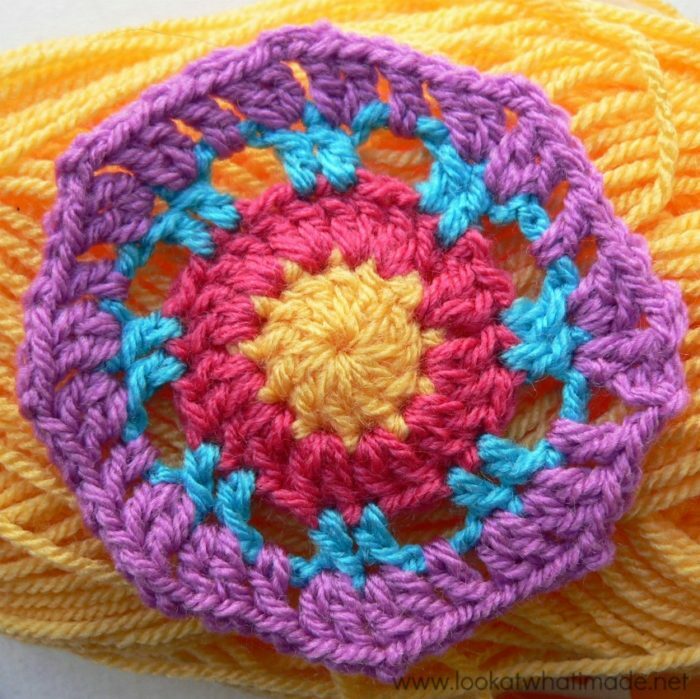 Who knew crochet squares could be such diva’s! Ps. I thought you might like to see some of the centers I have collected so far. Whatever will I be doing with them? Repeat around and join as instructed in the pattern. Ch 3 (counts as your first dc) and dc in the next 4 st’s (Photo 1). *(3 dc, ch 3, 3 dc) into the corner ch-3 space (Photo 2). Dc in the next 19 st’s. * Repeat around and join as instructed in the pattern. On the last repeat you will only make 14 dc’s, as you have already made the first 5 dc’s at the beginning of this round. 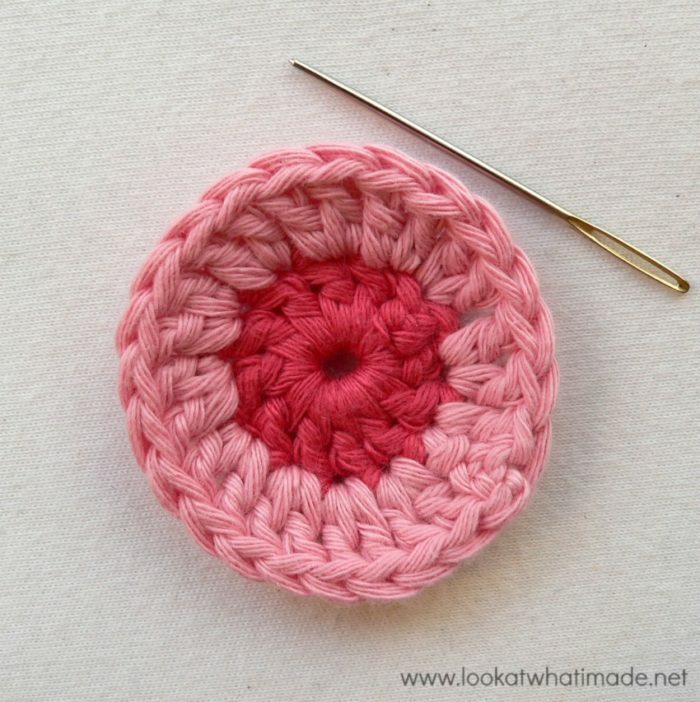 Be careful not to miss the first stitch after the corner. This round is straightforward. I have included some close-up photos, but I don’t think you need help with this one. One thing to look out for is that first hidden stitch. 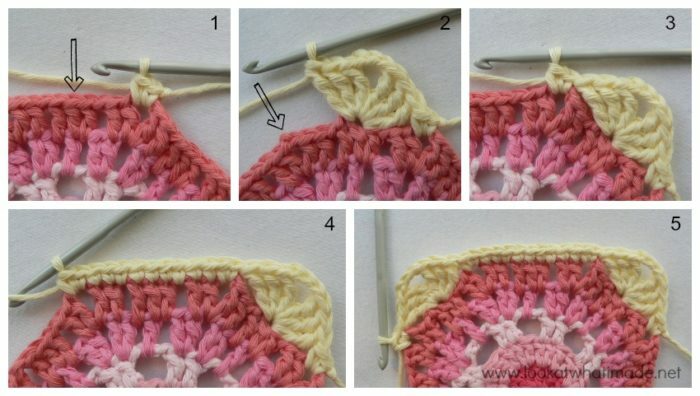 When skipping the first stitch after the corner, be mindful of the fact that the first stitch is slightly hidden (Photo 3). Don’t accidentally skip 2 stitches. You will be very annoyed when you get to the end of the round and your stitches don’t tally. In Round 9 there is only one thing to look out for. Yours truly forgot to make the ch st’s before and after each corner (indicated with an arrow below). Don’t make the same mistake. Apart from that, Round 9 is easy :) You are basically making 2 dc’s in each ch-1 space around, and a (3 dc, ch 3, 3 dc) corner in every corner ch-3 space. Round 10 is a standard dc round. My bad. I forgot to take a photo of Round 11 before adding the extra sc round. Round 11 is a repeat of Round 10, but with the corners again being (3 dc, ch 3, 3 dc). I know I’m a little late to the CAL but I am loving it. I have a question on Round 11 of Square 19. Round 10 had 36 dc per side and round 11 you are adding 3 dc in each corner so wouldn’t that make round 11 have 42 dc per side instead of 40? Thanks in advance for the help! Hi Gigi. 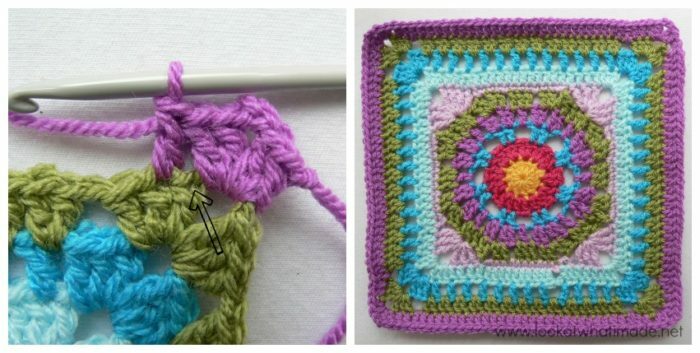 You are skipping the first and last stitch of each round, so you are adding 6 and taking away 2, which leaves you with 4 more stitches than the previous round. Does that make sense? I love your patterns, the description and your photos. I think there is a very small mistake. I think 36 dc per side (Doublecrochet not single crochet). 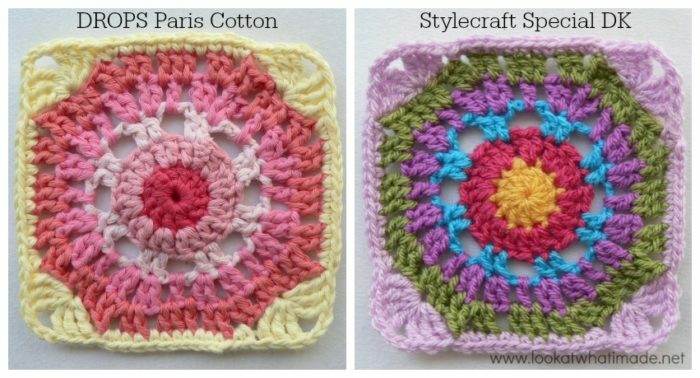 A question: in your photos you are using the Drops Paris yarn. 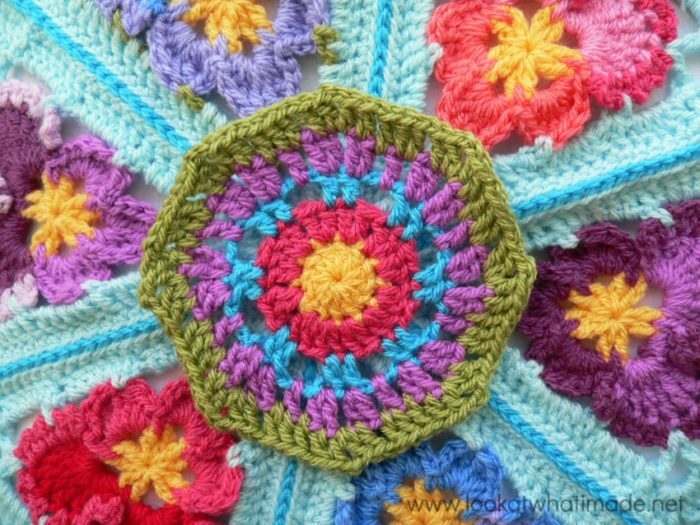 Have you also finished this blanket? If yes do you have any photos? :-). I didn’t do the whole blanket in Drops Paris. I only did parts of it for the photo tutorials. I am saving all the partial bits for another project, but I need quite a few more. Friedel, ek squirrel hulle almal weg vir ‘n latere projek. Ek het nogal nie so baie blokkies soos wat jy sou dink nie! Ek is bly jy geniet die tuts en dis def. beter om sommer van die rekenaar af te hak. Ek sal nooit al daai tuts uitprint nie. Ink is net te duur! 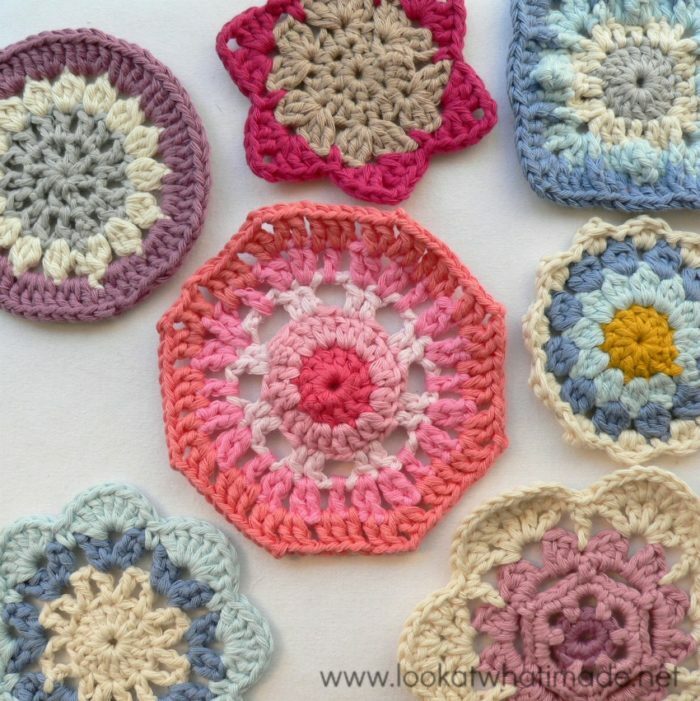 Hi dear , I really enjoyed your pattern , these are great . Thank you so much . I hope you have a happy weekend.